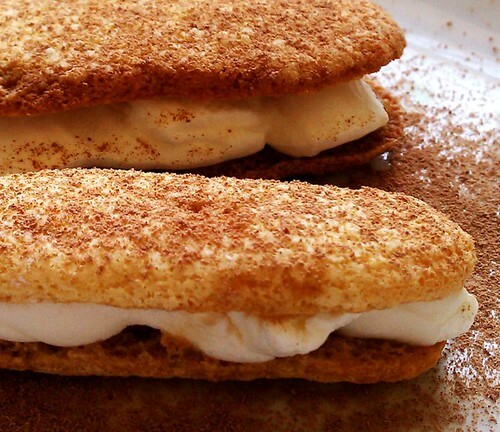 Tiramisu Sandwich ~ I Can Do That! It was love at first sight bite when I had tiramisu over 22 years ago. Soft lady fingers soaked in strong coffee nestled in rich zabaglione and mascarpone cheese cream flavored with marsala (or rum) then lightly dusted with dark cocoa; what's not to love? Unfortunately, I have also tasted some truly awful ones using chocolate cake as the base. Chocolate cake!!! Yuck!! Sorry for my excessive use of exclamation points but it's one of the reasons I make my own tiramisu. And thanks to our lovely hosts for February, Abigail and Marni for giving me another excuse to make them again, this time with a touch of Filipino flavors. In a flat container, stir together coffee and lambanog. In a small bowl beat together mascarpone cheese, heavy cream, and sugar until fully combined. Transfer into a pastry bag; snip half an inch opening. Dip just the bottom of one broa in coffee mixture, fill with cream, dip another broa, and top the filled one to make a sandwich. Grate tablea on top and all over the plate, if desired. Enjoy with a cup of strong espresso or barako. you got me at tiramisu. oggi this is soo divine! i would fall in love at first bite hihi! That's gorgeous, Oggi! I also fell in love with tiramisu the first time I tried it. Love your version! my first tiramisu was a failure! I will surely try this version. It looks soooooooooooooo good, and very tempting! I am so afraid to make Tiramisu .... but with your recipe I might finally give it a go soon .... Yummy! i never liked tiramisu but your version looks so tempting!!! I am happy to pass on the "Liebster award" to your wonderful blog! Please do take out time to stop by and collect your award. Hmmm, lambanog and mascarpone, interesting! But it sure does look gorgeous! Brilliant idea! Love how portable they are -- like chocolate eclairs. Thank you for the inspiration!! 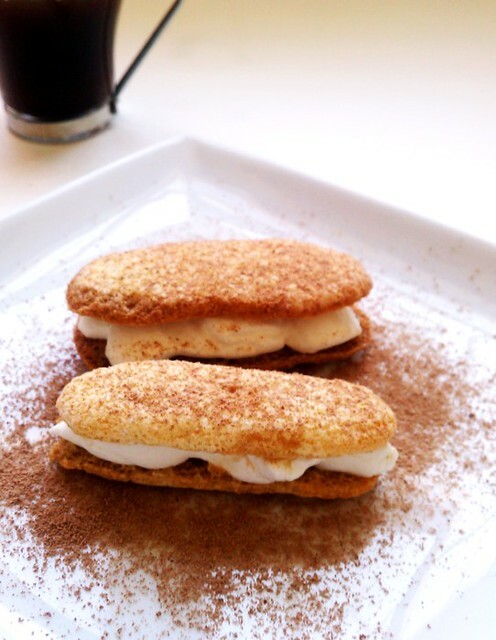 I love tiramisu... this is a great idea of making it without the fuzz...thanks for sharing this.